Sorry... the 2017 Buick Cascada is no longer being sold as new. Instead, take the first step to a great deal on 2019 Buick Cascada with a free price quote! 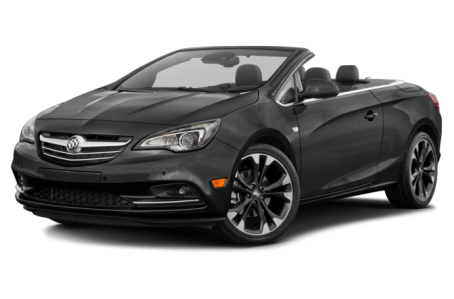 The 2017 Buick Cascada is a compact, 2-door convertible that seats 4 passengers. The design takes styling elements from the Opel Astra – a car from GM’s European division that the Cascada shares its platform with. While it does have some sporty features, the Cascada is really meant for cruising on sunny days. This year, the Cascada gains a new top-end Sport Touring trim level to go along with the base and Premium trims. Outside, the Cascada features sharp, European-style headlights, a short, yet sculpted body, and chrome accents for a more premium look. The Cascada also has a soft rooftop that opens and closes in 17 seconds at speeds up to 31 mph. Standard exterior features include articulating HID headlights, LED daytime running lamps, LED taillights, and two-tone 20-inch aluminum wheels. The new Sport Touring trim has two exterior color options: Sport Red and True Blue Metallic. Under the hood, the Cascada comes configured with a 200-hp, turbocharged 1.6-liter 4-cylinder engine and a 6-speed automatic transmission. Fuel economy figures are estimated at 20/27 mpg city/highway by the EPA. Inside, the Cascada has an upscale interior with heated leather sport seats, a dashboard wrapped in a premium, soft-touch material, and a 50/50-split folding rear seat. By opting for the Sport Touring trim in Sport Red, the Cascada will come with a unique Jet Black leather interior with contrast red stitching, while the True Blue Metallic version has a choice of two interior colors: Jet Black with white stitching and a two-tone Jet Black/Light Neutral treatment. The center console features the standard Buick IntelliLink multimedia system that includes a 7-inch touchscreen, Bluetooth connectivity for phone and audio, Siri Eyes Free mode with voice recognition, and a USB port. It can be upgraded with an integrated navigation system, OnStar 4G LTE connectivity with a WiFi hotspot (subscription required), and a 7-speaker premium audio system. Dual-zone automatic climate control, power windows/locks, and cruise control come standard. Sport alloy pedals are available as well. In the event of a rollover, the Cascada convertible has standard pop-up rollover bars that deploy from the rear seats. Other standard safety features include a backup camera, rear park assist, and a tire pressure monitoring system. Lane departure warning, forward collision warning, and front park assist are also available. Vehicle crash and safety data is provided by NHTSA, the National Highway Traffic Safety Administration. The NHTSA testing was established by Congress to reduce highway deaths and injuries. Read an article on the current NHTSA crash test program. 12 of 12 (100%) consumers said they would recommend this vehicle to a friend.